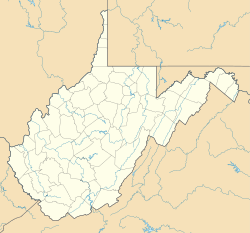 The Bower is an 1806 Federal style building in Jefferson County, West Virginia, USA. It was later remodeled with Gothic Revival features after a fire in 1892. The name appeared as early as 1753 when Major General Adam Stephen had a hunting lodge at this location. A land grant from Lord Fairfax, General Stephen lived at "Bower Lodge" from 1753 to 1772, when he moved to his residence in Martinsburg, Virginia, a town he founded. The Bower was given to his daughter Ann Stephen and her husband Alexander Spottswood Dandridge, whose first cousin was Martha Dandridge Custis Washington. The property passed to Stephen's only grandchild, Adam Stephen Dandridge I, in 1791. Dandridge built the main house in 1806. In 1833 The Bower passed to Adam Stephen Dandridge II. Novelist John Pendleton Kennedy visited The Bower in 1832, and based his novel Swallow Barn on his views of the estate. During the American Civil War, Major General J.E.B. Stuart set up a headquarters at The Bower at Adam Stephen Dandridge II's invitation. His staff included Generals Wade Hampton and Fitzhugh Lee, as well as staff officer Heros von Borcke from September 28, 1862, to October 10, 1862. A horse bred at The Bower was given as a gift to General Lee to use when his primary mount, "Traveller," needed a rest. That horse was the well known "Lucy Long." Danske Bedinger Dandridge, the wife of Adam Stephen Dandridge III, lived at The Bower for a time before moving to Rose Brake. Her poetry appeared in The Century and Harpers. In the early 20th century the house became a summer home for Bishop Edmund Pendleton Dandridge, Episcopal Bishop of Tennessee. The property remains in the same family today. ^ Michael J. Pauley (November 1, 1981). "National Register of Historic Places Nomination: The Bower" (pdf). National Park Service.